You must make reservations at least 5 minutes in advance of the time at New Delhi Restaurant. 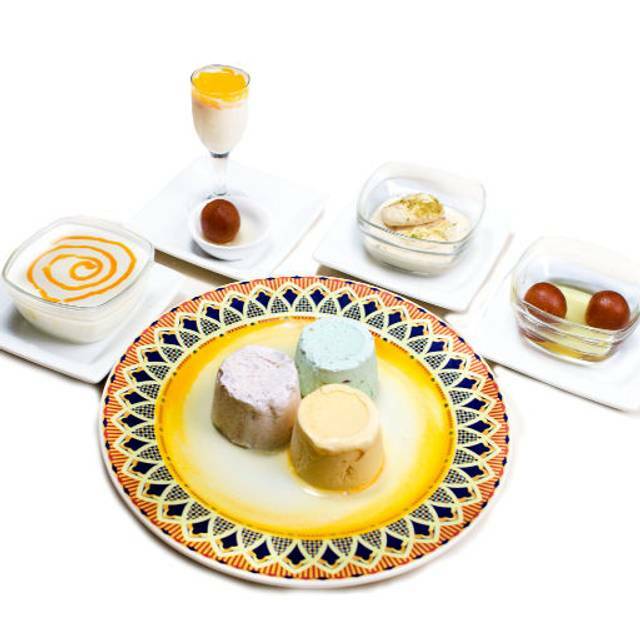 New Delhi Restaurant is located in the heart of downtown San Francisco. There is street parking available, and several parking garages including the "Ellis-O’Farrell Parking Garage' and 'American Parking Management' both within walking distances of the restaurant for your dining convenience. We are located one block away from the Powell BART Station which also serves SF Muni’s underground metro lines J, K L, M, N, and T. Above ground, bus lines 14, 27, 30, 38, 45, and F all have stops within a few blocks of the restaurant for your dining convenience. 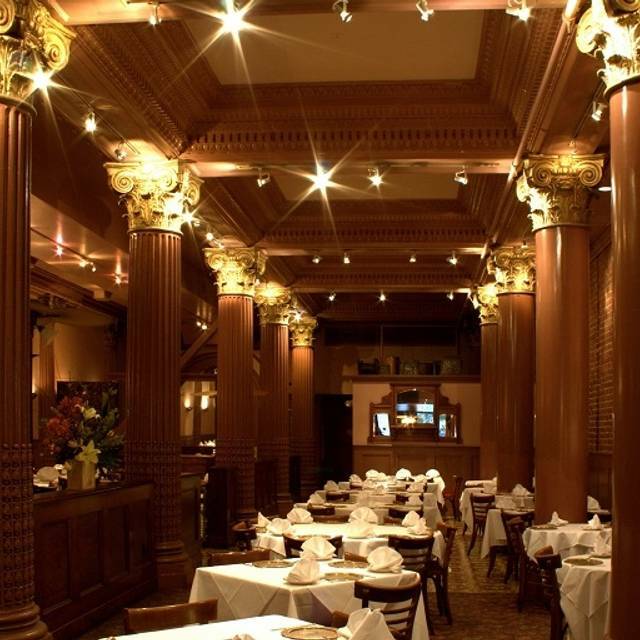 For over twenty years, New Delhi Restaurant has been host to many significant weddings and events held in San Francisco. We specialize in both on-site and off-site catering. We have exclusive relationships with The Ritz-Carlton Hotel, Four Seasons Hotel, Fairmont Hotel, Westin St Francis Hotel and St. Regis Hotel and working relationship with many downtown hotels. We specializes in regional Indian Cuisine from Punjab, Kashmir, Goa, Bengal, Hyderabad and Gujrat and have detailed knowledge of planning different religious wedding menus. Named one of the finest Indian Restaurants in the US by New York Times and featured on the Galloping Gourmet TV Show, New Delhi is the place to dine. Decorated like a Maharajah’s private banquet room, the restaurant serves cuisine made from recipes culled from the royal Indian menus dating back 300 to 400 years using the freshest local ingredients. Chef and owner, Ranjan Dey, star of PBS show – “MY INDIA” creates daily specials with his six gourmet spice blends, available nationwide in gourmet specialty stores under New World Spices. New Delhi Bar has been the favorite hot spot for many, working in the downtown, restaurant and hotel industry, since its inception in 1988. It is famous for its “Double-Happiness-Happy Hour” featuring complimentary appetizers. The first from 4 to 6pm and the second from 10 to 12 midnight – because not everybody works 9 to 5! Soak up the lively atmosphere and friendly company. Great food, very authentic. Had me sit at a table that faced another table just a few inches away from each other. Food is some of the best Indian that I have ever had. A must visit if you are in San Francisco. Go there when the owner is present. He is charming and a serious gourmand who knows his food. This is the beat Indian restaurant I have been to in The Bay Area. The Naan, Dal soup, butter chicken and saag paneer were all exceptional. Decor is neat, too. There is a reason they have been there for 30 years. This restaurant could be gorgeous but it’s not. The service was almost non existent. Did not check on us during our meal, despite needing our drinks refilled... no servers anywhere near to attract attention either and there could only have been maybe 6 tables with guests. The food was well below par for an Indian restaurant. The actual situation and decor was beautiful but not enough is being made of the restaurant. Carts with unused crockery, napkins etc. A blue plastic cart parked near the entrance to the kitchen. Emergency exit doors were dirty and miserable looking. The whole place needs an overhaul with far more attention to detail and your customers! Never had such bad naans - the garlic naans were horrible. I had ordered a mild dish which turned out to be very spicy. When asked to have it mildl, they took it back and added so much water in it that it was disgusting. Always enjoy the restaurant. We missed seeing the owner greeting the guests. Apparently, he was traveling. We look forward to seeing him next time. I would love to provide a better review. I really want to love this restaurant. Sadly, though, the food we had was mediocre at best. Perhaps it will improve when I return and try other things, in which case I will write a more positive review. The staff just aren’t very friendly. No effort to engage with us. We were looking for guidance about the food we were ordering and just didn’t feel we got that. Very disappointed and won’t return. Wonderful San Francisco dining experience near Union Square. Excellent food and service await you in New Delhi. This was my first visit to New Delhi, but it will now be my go-to spot for Indian food. To be perfectly honest, I have gradually cooled to Indian restaurants over the past ten years or so. The main reason is that I found myself coming away feeling that every meal was basically the same, and that boiled down to mushy curry dishes over rice. With that in mind, my experience at New Delhi was a welcome breath of fresh air. The large menu offers many distinctive dishes. I had the Balti Style Mango Prawn dish and loved it. The waiters were very attentive. Great place we found close to our hotel and could book on open table! Very authentic and our waitress made a suggestion from my norm and really hit the spot. Kudos! My wife and I chose to eat here because it was conveniently on the way to the Curran Theatre from BART. We enjoyed the samosas, papdums, sauces, eggplant tamarind and Alu chat croustade. The by-the-glass house cabernet and zinfandel were acceptable. We don't recommend the assorted tandoori platter (dry and not tasty) and paneer pakora (not tasty and not stuffed with chutney as listed on the menu). We ordered vegetarian food. The appetizer was ok but the entrees were too salty. Very disappointing- hadn’t been here for a few years and won’t go back. Chicken tikka was dry. Eggplant was too salty to eat. One of the best Indian meals I've ever had and I eat Indian food nearly every day. The food was authentic and not heavy with oil or gee. Compared to other restaurants in SF this was really good value for money. If you don't mind being seated near the bathroom and where they store the extra catering lids and bins of odds & ends, as well as not being attended to well then I would recommend this. The food was very good but the service & where they hid us was not so great. The food was good but the presentation could be improved especially the rice served on plates is very hard to enjoy when it consistently is falling on the table. No Indian beer available, Garlic nan came with a powder spray on the regular nan, asked for butter nan, which came with no butter. Service is horrible. I would not go there again. The food was very good but the service was terrible. The waiter got the order wrong, 3 out of 4 got it right and when the right order finally came all 3 had finished their food and there was no apologies. So even though it was good food we will not be back. Our server was clueless in trying to describe the wine selection. Excellent Indian food -- only the desert was disappointing -- otherwise five stars. Overall, we like to go there. It is difficult to pick dishes for small childs since almost everything is too spicy for them and one has to pay the full adult price. The ambiance is special, but very nice. The place is somewhat too pricey given the moderately sized portions. Wonderful service, lovely ambiance and absolutely delicious food! Just ok I’m afraid. Interesting that they offer a free dessert if you post a positive review while you are there and show it to them. Not sure how unbiased the reviews are? Anyway, not a terrible meal but by the same token, not a memorable one. Great food, service was first class not rushed at all. My wife and I enjoy Indian food very much and always take the opportunity to go, especially when our children are not with us LOL New Delhi was definitely worth the trip and overall an extremely positive experience! We were looking for a decent Indian restaurant in SF but were unfortunately were disappointed. Nice decor but our table was right next to a pillar which blocked our view. Also, looked like they were doing remodeling. Wine selection was very limited; servers didn't know that they should let the patrons taste the wine before filling glasses. The chutney served with poppadoms was liquid rather than jammy as it should be. Chicken madras and tikka masala were OK but nothing special. Skipped desert and went elsewhere. This was such a great find. Wonderfully delicious, complex flavors. A great value in the city. Deceptively large restaurant, friendly staff, quick service and good food. Wonderful restaurant with vett good food. We started with the Alu Tikki, which were as crunchy and spicy as advertised. I went for the Kofta Shah Jahani (first time; I'd always wondered about the dish), and the other folks in the party went with chicken, lamb, and veggie curries. The dishes arrived hot, with the naan basket and rice right behind them. Servers were prompt, answered all the questions we had, and we even got a taste of the owner's delicious home creation--a ghost pepper chili mix that got one or two of us a little hot under the collar so to speak. One of the group said it was the most delicious Indian food he'd ever had. Excellent restaurant. Great food and service. I recommend it to all. Very pleasant ambiance and staff...and good food. We had an absolutely wonderful time here. The food was delicious! We ordered about five different dishes to share and loved them all. Samosas were great- not at all greasy. Loved the beautiful setting too. Dishes were served in unique dish ware giving an unique touch. The service was excellent- attentive but not overbearing. We loved it! Grand dining hall. Attentive staff. Good place for a large group in SF with reasonable prices. Staff will help you with ordering for your large crowd. Very tasty.